myoldmac.net - ENTEX - PacMan2 Handheld Tabletop for two players! 1981 - Buy it! 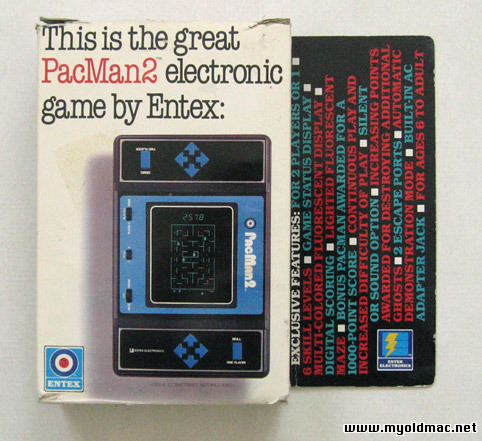 Entex PacMan2 tabletop console, in good condition - with styrofoam in original box and instructions. Both battery compartments are clean and both covers are included, on one cover the closer has brocken (but is included). Please see the Photos. 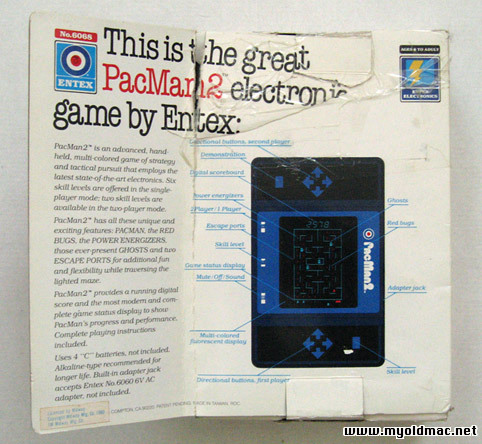 Case and electronics designed and programmed by Entex Tokyo Entex Pac Man 2, based on Bally/Midway's Pac Man arcade game. Called Pac Man 2 because it allowed two people to play at once (there is no 'Pac Man 1'). 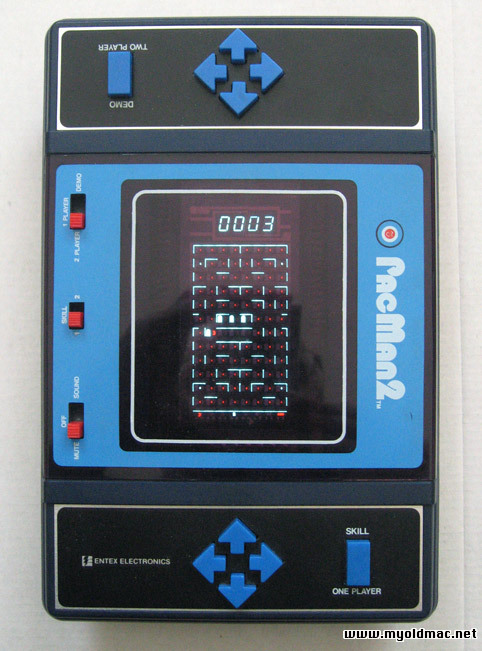 Player one would be the Pac Man, player two would be the ghost chasing him (in this mode, there is only the one ghost). 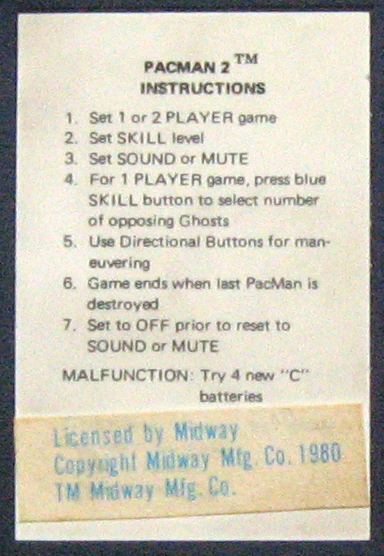 One player could also play Pac Man normally with the difficulty setting determining whether there are 2, 3, or 4 ghosts chasing you. It was also released in Japan with a different name: Hungry Pac. 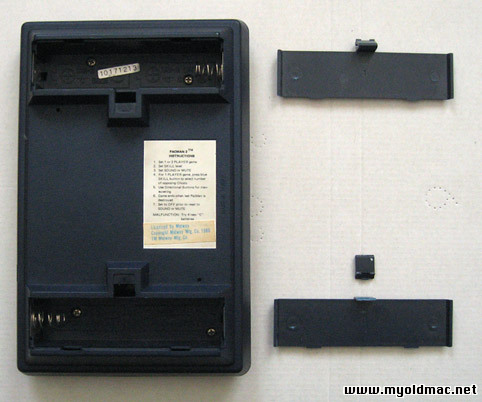 This electronic game has a built-in adapter jack. When the adapter is used, no batteries are required. It accepts Entex #6060 6V Adapter (not included). 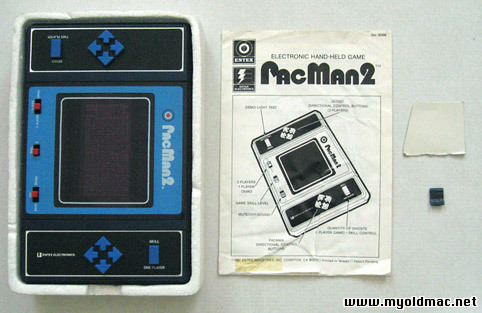 Die legendäre PacMan2 Tabletop Konsole von ENTEX (nur Verkauft in England und Japan), in sehr gutem Zustand, mit original Verpackung, Styropor und englischer Spielanleitung. Sehr selten in Deutschland zu finden in diesem Zustand. Mit Styropor, Manual, einer losen Boxenkante und dem abgebrochenen Teil des Batteriefaches. Rückseite der Box, teilweise mit transparentem Klebeband "repariert"